I need a little advice as to identifying if this necklace is made of real Baltic amber. I have just brought a necklace and have ran a few tests on it to try to determine if it's Amber, Copal, plastic or something else. UV light = On order, yet to arrive. Hot pin = Not yet tried. Salt Water = Sank! = Noooooooo!!! ... HOWEVER THE BEADS ARE INTERSPERSED WITH OTHER SMALLER METAL BEADS, MAYBE SILVER, YET TO CHECK. 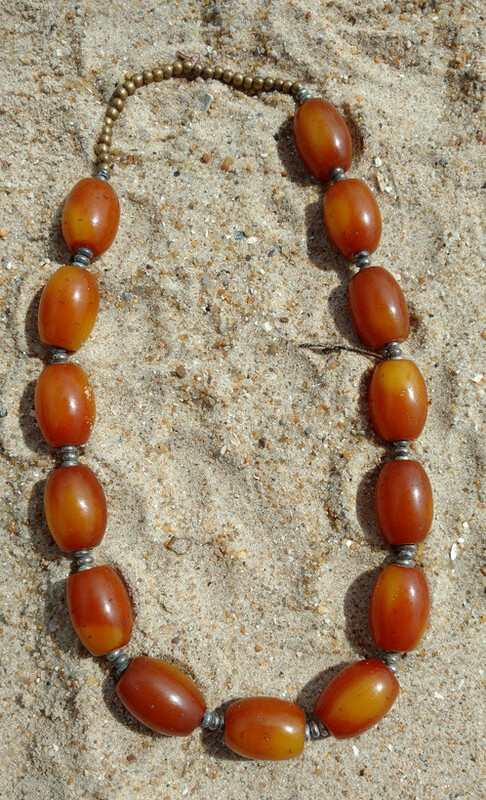 QUESTION: COULD THE PRESENCE OF THE MUCH SMALLER METAL BEADS BE CAUSING THE NECKLACE TO SINK IN SALT WATER EVEN IF THE LARGER BEADS ARE ACTUAL AMBER? Also anyone want to comment on the photos, does the necklace look like real (Butterscotch/Egg Yolk) amber. Does to me but I'm no expert. HI Mark, this looks like Copal Amber to me. The light opaque color usually indicates "Copal" over the actual semi clear Amber. Copal is much younger, but is sometimes as popular or even more popular nowadays! Also - If your beads are sterling silver please don't put them in Salt - It will eat into the silver and destroy the beads. Please make sure you did rinse the necklace really well, just to prevent this. I'd guess this is the Baltic Copal, not the African variety. Photo below to show you. The Baltic copal sometimes has mixed in amber, and it always feels like light plastic to me. If that's any help? I did wonder if the beads might have been Copal, but when I rubbed/soaked them in acetone they remained smooth & clear. I understood that Copal becomes tacky if subject to acetone? Now I wouldn't know on that point, however the color you have here is opaque - Actual Amber is clear to semi clear with inclusions: insects, branches or other debris. Copal has none of those things, is solid opaque in color - usually a butterscotch. Just soaked one of the beads in acetone for a whole '6' minutes (Much longer then before) and the bead still remained hard, did not soften or become tacky. There is a point at which Copal becomes Amber as it goes through the same process (Amber millions of years, Copal hundreds of thousands of years - Up to one million supposedly), the jury is still out as to when one becomes the other. Because the acetone had no effect on the bead I am assuming that the bead is very old Copal nearing the point of transition to Amber. That is certainly a possibility. But, If your selling this piece, still I would call it or list it as "Copal Amber, Chunky Butterscotch beaded Necklace". That is usually the main info buyers want. I've sold every amber or copal necklace I've put in my Antique Mall booth over the years. It seems to always be a popular item!